This week's tablehopper: feed me, Seymour. A beautiful start to a meal at Lord Stanley: onion petals and sherry vinegar, olives, and a Negroni Sbagliato. Photo: © tablehopper.com. Hello dearies. Happy Friday to you. I have DJ Koze’s brand-new DJ Kicks album on, feeling some weekend vibes. My sense of freedom started a day early: I was called into jury duty on Thursday morning, and fortunately the stars aligned and I was excused in the afternoon, just in time to go enjoy a honking D. Rubin sandwich (well, half of one) from Deli Board. Silver linings. It was also pretty funny to run into three people I know there. (Hey, misery loves company.) And I love our small city. This weekend, we have the newly refurbished northern section of Dolores Park to enjoy. (All that fresh grass! Bathrooms! New tennis courts! Benches!) Tonight, our City Hall turns 100. Sunday is the solstice, and also is Father’s Day, although our recap of where to go includes a Saturday pig roast as well! I know, Sunday is all about dads, and I can’t wait to celebrate mine, but today’s issue includes a little weekend hot sheet I put together, featuring some news and stories all about women, from kickass things they are making, to different ways you can support them, to projects in their honor. And you don’t think I was going to let you miss the first National Kouign Amann Day, did you? Anything to give you a reason to indulge, I’m here for you. Enjoy your weekend. Charleston, you are on our mind and in our hearts. Now that’s a party. A dream box of kouign amann from B. Patisserie to celebrate National Kouign Amann Day. Photo: © tablehopper.com. The killer porchetta at B. on the Go. Photo: © tablehopper.com. The two Not for Sale beers from Half Moon Bay Brewing Co. Photo via Facebook. 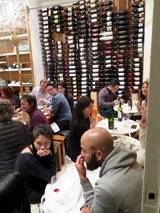 The social scene at the Masak | Masak pop-up at Biondivino. Photo: © tablehopper.com. Nasi ulam at the Masak | Masak pop-up at Biondivino. Photo: © tablehopper.com. 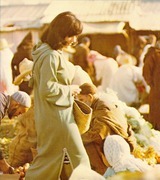 Paula Wolfert shopping in Marrakech, 1973. Archival image by William Bayer. Paula Wolfert and Emily Kaiser Thelin. Photo: Eric Wolfinger. Did you know that Saturday June 20th is the very first National Kouign Amann Day? You can thank local pastry wunderkind Belinda Leong and ~B. PATISSERIE~ for making that happen. So how to celebrate the glorious butter cake from Brittany? Well, Belinda and crew are unleashing a massive array of flavors that you can try on Saturday: black sesame, vanilla bean, pistachio strawberry, chocolate hazelnut, speculoos cookie, coffee, maple bacon, peanut butter and jelly, cinnamon sugar, and a really decadent one with lemon lime custard in the middle. There is also the classic one, a spiral one, and kouignettes. Oh yeah, and kouign amann ice cream. You can get the entire box of 12 flavors for $56 (make sure you have some friends to share with, okay?) or you can buy them piecemeal. I was really damn lucky to preview the flavors (I know, I know), and my favorites were the black sesame, coffee, and the maple bacon for breakfast was downright amazing. Go nuts, because 10 percent of all proceeds will be donated to Family House San Francisco. It’s a TKO with the KA! And don’t forget to tag #NationalKouignAmannDay. Also in Belinda news: the plan is to open ~B. ON THE GO~ tomorrow as well (Saturday June 20th). You can read the earlier tablehopper piece here. So here’s your plan of attack: pick up a porchetta sandwich at B. on the Go, and then get your KA kitty-corner at B. Patisserie! Hours at B. on the Go will be Tue-Sun 11am-4pm. 2794 California St. at Divisadero. Here are two beers you’ll want to track down for your next picnic or party: the Half Moon Bay Brewing Co. has partnered with San Francisco-based nonprofit Not For Sale on two beers, with proceeds going toward curbing human trafficking worldwide. 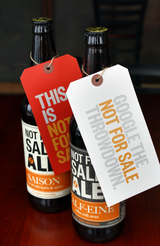 They just released the Not For Sale Saison (trust, you want this farmhouse ale in your life), which the press release tells us “is made using a Peruvian herb called cat’s claw, which is ethically sourced from a region in Peru where Not For Sale manages social programs to combat human trafficking, as well as honey, ginger, a Belgian saison yeast, and hibiscus flowers, which give the beer its peach color.” It’s a beaut. And then for dessert, the Calf-eine Coffee Milk Stout, brewed with 15 gallons of Guatemalan medium-roast cold-brew coffee supplied by Dignitá, a coffee bar in the Dogpatch. The Half Moon Bay Brewing Co. is donating $25,000 per year until Saison and Calf-eine sales exceed $1 million, then 2.5 percent of its gross sales after that. You can find them at the brewery, select bars around the Bay Area, and in 22-oz. bottles at many retail locations—keep your eyes peeled. And one more thing to note: Not For Sale has launched a new “Throwdown” campaign, which fights human trafficking with the help of local CEOs and professional athletes who donate a day’s pay to the nonprofit “so that others may become free for a lifetime.” San Francisco Giants relief pitcher, Jeremy Affeldt, is one. But really, anyone can donate a day’s pay. Check it out. If you love wine and culinary adventuring (and I think you do, because you read tablehopper), you should mark off an upcoming Wednesday night on your calendar and attend the Masak | Masak pop-up at ~BIONDIVINO~. A few weeks ago, I was so utterly charmed by the eclectic vibe and communal experience. As soon as you walk in, you are greeted with a warm and friendly atmosphere, with people sitting at the little café tables inside and crowding around the communal table, talking and eating and laughing over glasses of wine. I immediately felt like I had walked into such a great discovery—it had the feeling of some of my favorite European cafés and wine bars. 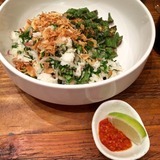 The details: every Wednesday evening, Kuala Lumpur-born Emily Lai (she used to work in New York at Fatty Crab and Tailor) serves a short and rotating menu of her heartfelt and homey Malaysian dishes. On the night I was there with friends, we shared curry yong tau foo (tofu puffs, shrimp, long bean, chile, scallion, coconut, mantou), chawan mushi, my favorite dish of the night, the fragrant and vibrant nasi ulam (rice, kaffir, shallot, myoga, betel leaf, Vietnamese coriander, mint, okra, shrimp, sambal belacan), plus bebek bengil (duck leg, ginger, galangal, turmeric, rice, sambal matah) and ice cream pudding with pandan for dessert. It’s remarkable how much work she does ahead of time to make these dishes, and what she does with the tiny counter space at Biondivino. Ceri will brilliantly pair wines with your meal, and if you don’t have time to hang out, you can bring to-go containers and bring the goodies home with you. (But really, you should hang out.) Subscribe to the Biondivino mailing list to keep up on upcoming menus (and Emily’s occasional nights off). 5pm-10pm. 1415 Green St. at Polk. And last, but certainly not least: anyone who loves to cook Mediterranean dishes (and is drawn to the flavors of Morocco) probably has a book from cookbook author Paula Wolfert on their shelves. Three years ago, this fiery and trailblazing woman was sadly diagnosed with Alzheimer’s disease, and she is now known for being as much of an Alzheimer’s activist as an author. And now, some well-respected folks in our food community want to publish a biographical cookbook on Paula Wolfert through crowdfunding: Unforgettable: Bold Flavors from Paula Wolfert’s Renegade Life. Please, take a couple of minutes to read this page about Paula, the book, the mission, the players, and the plan, which is aiming to double the print run of this small-batch publishing book. It’s incredible to see how food writer Emily Kaiser Thelin, cookbook author Andrea Nguyen, photographer Eric Wolfinger, and Toni Tajima (former designer at Ten Speed) banded together to honor Paula’s legacy with this project. All kinds of folks have backed it, from followers, friends, and colleagues to Ruth Reichl, Harold McGee, and Dorie Greenspan. There are also chef and restaurant pledge premiums from people like Daniel Patterson, David Kinch, Mario Batali, April Bloomfield, and Pim Techamuanvivit. Buy one for yourself (just $35) and buy one for your favorite cook in your life (just $65 for two), but be sure to look at all the amazing benefits and gifts. Thank you for showing this campaign your support! Rendering of the rooftop bar at the Archer Hotel in Napa. Courtesy of Archer Hotel. Rendering of the Archer Hotel in Napa, slated for a late 2016 opening. Courtesy of Archer Hotel. The Guerneville Bank Club features ice cream from Nimble and Finn and chile apple pie from Chile Pies. Photo courtesy of Heather Irwin. Charlie’s Wine Country Three-peat: Chef Charlie Palmer is on a roll. Following his recent St. Helena restaurant opening at Harvest Table, he announced yesterday that he’ll be opening ~CHARLIE PALMER STEAK~ in downtown Napa. The restaurant and rooftop bar is slated to open at the forthcoming Archer Hotel, a 183-room luxury property planned for late 2016. The hotel and restaurant will be the centerpieces of the 275,000-square-foot Napa Center, which is being hailed as a game-changing “Napa Valley experience” with more than 40 shops and restaurants. Palmer has steak houses in New York, D.C., Las Vegas, and Reno currently. The tireless chef also recently released a cookbook, Charlie Palmer’s America Fare. There’s still a grandiosity to the ~GUERNEVILLE BANK CLUB~, though the safe is now a photo booth and the tellers have been replaced by ice cream scoopers. The 1928 bank building has been rehabbed by locals and is now an ice cream and pie shop with retail space, an art gallery, and the Russian River Historical Society. We’re smitten with ~NIMBLE AND FINN’S~ cheeky scoop flavors, including Manhattan (whisky, vermouth, and cherry chunks), blueberry cheesecake, and vegan strawberry, rose, and geranium sorbet. Paired with ~CHILE PIES’~ sweet apple and chile pie with a drizzle of chile-infused honey? Solid gold. 16290 Main St., Guerneville.